Find Us in North Houston! The new homes for sale in Harmony are conveniently located in north Houston at the Grand Parkway and Rayford Road providing residents with direct access to major employment centers including the new ExxonMobil campus. Harmony is minutes from shopping and entertainment destinations, grocery stores, banks, several major hospitals, outpatient surgical centers and specialized healthcare facilities. It is also nearby The Woodlands Mall, Market Street – The Woodlands and the Cynthia Woods Mitchell Pavilion. 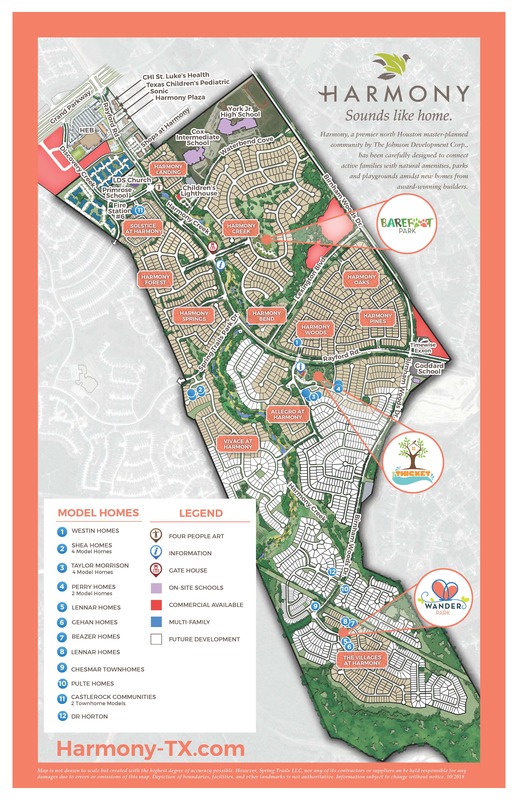 Harmony is a 1,000-acre master-planned community with home sites for 2,600 new single-family homes from award-winning home builders. The tree-lined community also offers more than 35 acres of prime commercial property including an area for a new H-E-B.